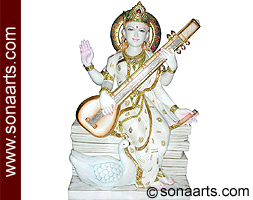 Beautiful marble statue of Saraswati is playing the veena. In her other two arms she holds a copy of the vedas as well as prayer malas. She is seated on a Stone base. This Beautiful statue are carved and painted by high skill craftsman.